Time to get out the knotted hanky and buckets and spades, it’s August, so it must be Holiday Feast! 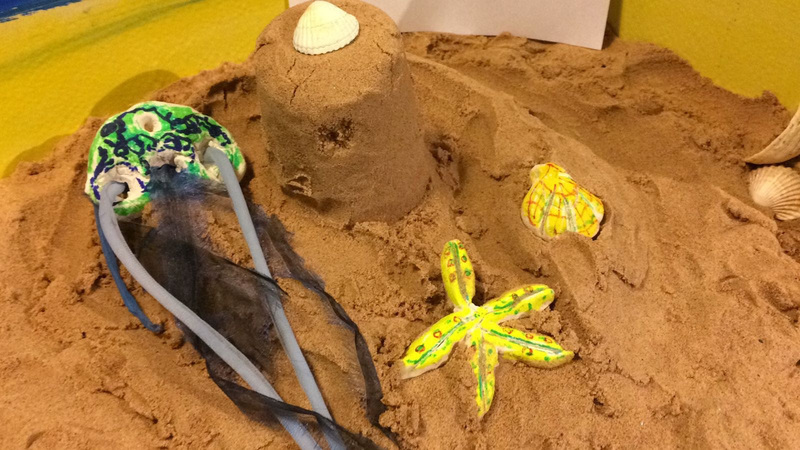 We’ll be getting arty and crafty with holiday themed crafts – mini sandcastle making and salt dough sea creatures to paint at Artisans, whilst over at Family Wellbeing, we’ll be decorating paper swimsuits and shorts on the kids activity table and having fun with more sand and beachballs. At St Luke’s we’ll have a brand new folk band entertaining us, The Conquering Heroes – and we’ve heard they do a bit of dancing too! They’ll be followed by Monkey Wrench, whilst Steve and the Hats and Uffington 357 will be doing their thing down at Artisans. Poetry Slabs will be back at the Old Library with an American theme this month – featuring the work of Pulitzer Prize-winning poet Elizabeth Bishop, from 2.30-3.30pm. “wry, sly, sometimes exotic, frequently gritty, surgically crafted and strangely witty”. The Portico Gallery will be showcasing the work of young artists in an exclusive show, ‘People in Residence’ bringing together recent graduates from Wimbledon College of Art. The exhibition celebrates unity and community. The exhibition is then open to all on Sunday 6th for Feast! 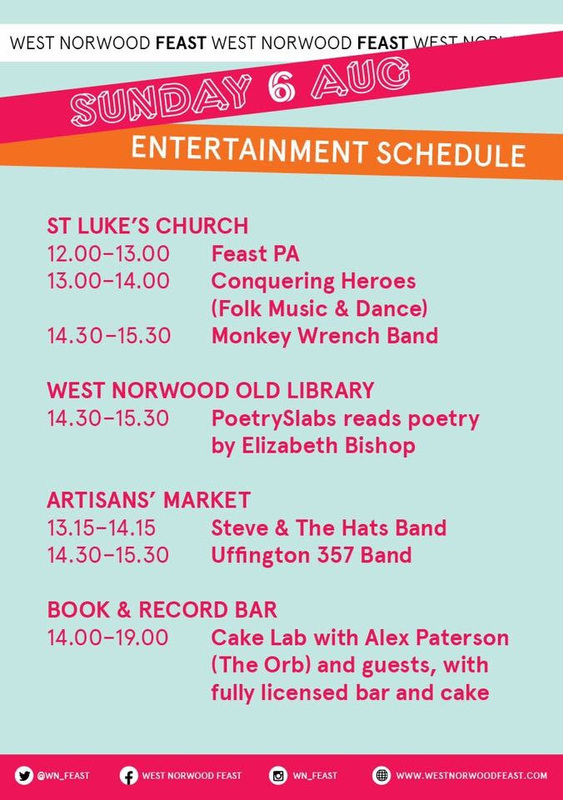 The Book and Record Bar will have Cake Lab, with Alex Paterson (The Orb) and guests, DJing from 2 until 7 on the Sunday, with fully licensed bar and cake. As ever, Wingit will be wowing us with song and dance from the young people of West Norwood. 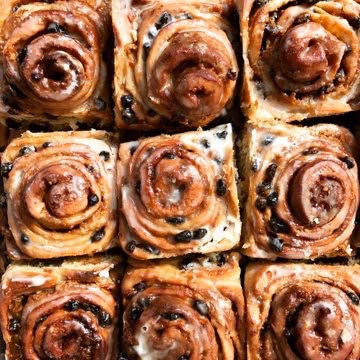 At Retro Village, keep an eye out for a vintage summer theme, with picnic ware, summer frocks, and colourful sunnies, whilst at the Food Fair we are excited to have bakers Brett and Bailey, regulars in Crystal Palace, at Feast for the first time (Chas and Momo are away for one month, but don’t worry, they’ll be back!). We’ll also be welcoming back Vegan for Non-Vegan who make amazing pasta and gnocchi which is vegan AND gluten free, so spread the word to your vegan & GF buddies. So, grab a sunhat and sunscreen, keep your fingers crossed for the weather to hold (it WILL! ), and we’ll see you there! PrevPreviousSports Feast on Sunday 2 July!